My Impressions: Simon Says Stamp September Card Kit Reveal and GIVEAWAY! 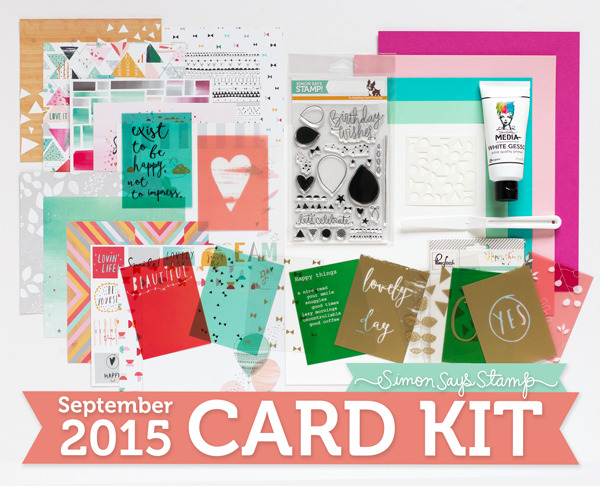 Simon Says Stamp September Card Kit Reveal and GIVEAWAY! This month's kit includes a number of fun products including Simon's new Birthday Bits Stamp Set, PinkFresh Studio Happy Things Acetate Cards, Dina Wakley Ranger White Gesso Tube, and Simon's Playful Circles stencil which is exclusie to the kit. For today's card I decided to use some of the fun techniquey (that's a word right?) products that came in this month's kit. I started with the Simon Says Stamp Playful Circles Stencil from the kit along with some of Simon's Scuba Ink and a Round Ink Blending Tool to create the geometric background on Simon's Audrey Blue Cardstock. The geometric shapes found in the bottom left corner of the new Simon Says Stamp Birthday Bits Stamp Set are a perfect match to the shapes in the stencil. I used the striped shapes along with Simon's Scuba Ink to add interest to some of the stenciled circles and triangles. I then diecut the panel with one of Simon's Stitched Rectangle Dies and adhered it to my card front. I then took one of the Happy Things Patterned Acetate Cards from PinkFresh Studios and smeared some of the Dina Wakley White Gesso on the back of it with the Ranger Pallet Knife. Once dried, I stamped my sentiment on the front using Ranger's Jet Black Archival Ink and let that dry as well before adhering the panel to my card. NOTE: I had planned on using Stazon Black ink for my stamping but my ink has dried out and I need to buy a refill. The Archival Ink seems to be holding up ok but if I really rub it with my finger it does smear slightly. You can pick up the Simon Says Stamp September 2015 Card Kit for just $29.95 + shipping. If you'd like to receive this kit and future kits for only $24.95 + shipping per month, you can SUBSCRIBE HERE. Heidi, the wonderful owner of Simon Says Stamp, has given me an extra Simon Says Stamp September 2015 Card Kit to pass on to one of you! Just leave a comment on any or all of my Septemeber Card Kit blog posts and I'll announce a winner Friday, August 28th. What a fun card! I can't believe it's kit time already! Love it! This is such a great kit! Every month seems to out do the month before. Your card is great. Love it. Beautiful card! Hopping over to see what other beautiful creations you've done! Love everything you did here! Wow, this kit looks amazing! Your card is beautiful! The gesso on the acetate is such a cool effect - must try this! This looks like such an awesome kit. I like your card! Techniquey, indeed, Sarah! You always use things from the kits in ways I have never thought of! Thanks for all of your inspiration! Paulette S.
since my blog was moved to WordPress and most Blogger blogs don't let me use my WP identity, nor will Blogger aka Google allow me to delete or edit the long expired Paulette S. profile, nor will they do it for Me!! And they wonder why people are so hateful to them...go figure. These card kits seem to get better each month. Love your card. Thank you for the chance to win it! looks like a great kit! can't wait to see what else you come up with! Such a cool design, love your card!!! Very pretty design .... and I love that sentiment. This kit looks amazing and I'm looking forward to all your cards over the next few weeks. This one is fantastic and love the teal background pattern. And thanks so much for the chance to win too! Great card! I really love how you used the gesso/acetate! Fantastic card Sarah! You know I love your style! ;) I like how you used the gesso. Gorgeous colors and such a gorgeous card!!!! This looks like an awesome kit. Your card is beautiful. I love the new SSS card kit especially the stamp set. Thank you for the chance to win. The whole kit looks so beautiful! Great card. I love how you used the kit. Wow! great card! And thank you for sharing your technique process. Amazing kit! Ok this kit my be my favorite in a long time! Love your card! Wow, this kit is lovely and your card amazing! Great color scheme on this card. Gives me the feeling of a summer breeze. Loving the teal color and those adorable stenciled circles! What a fun and playful font on your sentiment as well! Such a beautiful card! Love all the techniquey things. Thanks for the chance to win this kit. I always enjoy the cards you create with the kits. Thanks for the opportunity to win this months kit. I love the artsy look of your card. I really love this month's kit! Your card is beautiful! Great card, what did you use to adhere the acetate to the card?